Canford Cliffs is renowned for its variety of stunning properties. The affluent area boasts chic apartments and imposing family homes, each as desirable as the last. Just Shutters Canford Cliffs understands that whichever type of property you may own, it is your castle. Therefore, our experts are passionate about providing stunning bespoke plantation shutters to add a sense of grandeur to your interiors. Call our team today on 01202 240769 to start your Just Shutters journey. Firstly, shutters are indisputably stunning! They make for a luxurious addition to any home! Furthermore, our shutters are entirely bespoke, being made to measure for each customer. As a result, you can rest assured that the shutters you will receive are completely unique -browse our extensive range of products to see for yourself. 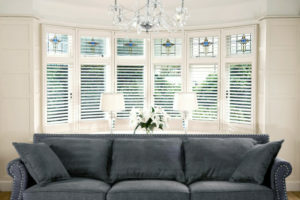 Furthermore, why not get inspired about the possibilities of shutters in your home by browsing our photo galleries. Furthermore, we are so confident in the longevity of our shutters that we offer a lifetime guarantee. Therefore, you can rest assured that shutters are a wise investment. Just Shutters Canford Cliffs – operated by Just Shutters Dorset. The Dorset division is the Head Office for the national Just Shutters. Contact the expert team today on 01202 240769 to start your Just Shutters journey! Whether you are looking to book a home design visit, or have a general enquiry, our dedicated team are on hand to help.